Ella Liddington-Walsh is turning quietly—make that noisily—insane, and it is all soldier Dillon Williams's fault because the ghost harassing Ella belongs to HIM. 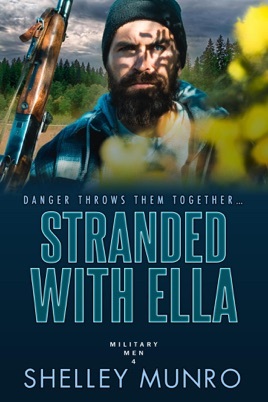 Sleep-deprived and desperate, she drives to his country property to confront the man. One way or another, she will pass on her problem and finally sleep through the entire night. Not that her task will be easy since Dillon strikes her as a no-nonsense military man. A believer in ghosts—not so much. Widower Dillon judges Ella's pink hair, her weird stories of haunting and decides she's crazy. He sends her packing, but a landslide brings the sassy lady returning like a boomerang. Unable to deny her shelter during the stormy night, he discovers an unwilling fascination and attraction for the curvy Ella, along with common ground and whoa! Steamy hijinks in his big bed. After his wife's murder, Dillon isn't looking for romance, but a chance discovery brings the past and the present on a collision. Dillon realizes he likes Ella more than he should, and if he doesn't stay alert, he'll lose her in the same way he lost his wife. Contains a determined, vintage-wearing heroine and a grumpy soldier who wears guilt like a second skin. On paper, they shouldn't work but there's no accounting for the power of attraction and a landslide blocking the road.